There are a lot of vegetarian people in Britain, and only a few of them in France. This explains the difficulties met by British vegetarians when they come to France, as the offer for vegetarian food is so low. 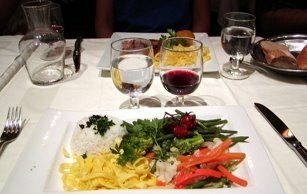 This site will provide vegetarian (and also vegan and semi-vegetarian) people with advice and tricks about the french food and eating out in France, together with some web links to vegetarian diet related sites. You will also find useful links for British people living in France or planning a stay in France, which are not related to the subject of vegetarianism. It is really hard to be vegetarian in France, let alone vegan. Your site will offer useful info! Thank you for your comment. I will post more information.